1974 Ohio INSPECTION Sticker - $20.00 : Bob Hoyts Classic Inspection Stickers, Add a Final Touch to your Restoration! 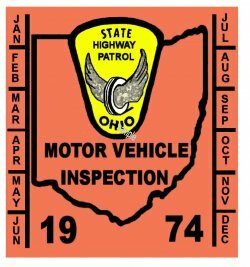 This 1974 Ohio sticker was digitally restored and reproduced, both front and back keeping true in color and size to the original. It has a panted "Peel and stick" format to peel off the front cover and adhere to your windshield.